To start voice command, shortly press the key on the steering wheel remote controller. While the guidance message is being stated, shortly press the key (under 0.8 seconds) to discontinue the guidance message and sound the “beep”. 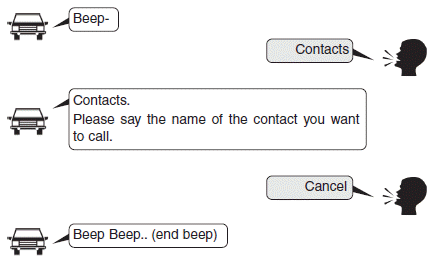 After the “beep”, say the voice command. While using voice command, press and hold the key (over 0.8 seconds) to end voice command. While using voice command, pressing the steering wheel remote controller or a different key will end voice command. In a state where the system is waiting for your voice command, say “cancel” or “end” to end voice command. In a state where the system is waiting for your voice command, shortly press the key (under 0.8 seconds) to end voice command. For proper voice recognition, say the voice command after the guidance message and the “Beep” sound. 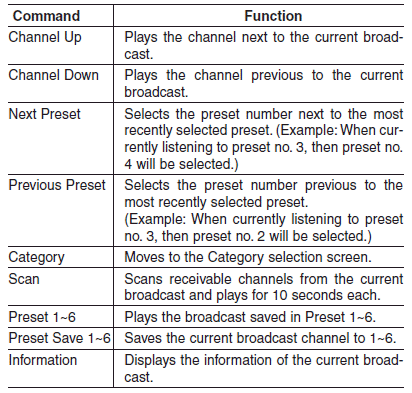 • The voice recognition feature of this product supports recognition of the commands listed within this user’s manual. While using voice recognition, operating the steering remote control or the device will terminate voice recognition and allow you to manually operate desired functions. Position the microphone above the head of the driver’s seat. For superior performance, maintain good posture when saying voice commands. After downloading Bluetooth contacts, the system requires some times to convert the contacts into voice information. During this time, voice recognition may not operate properly. 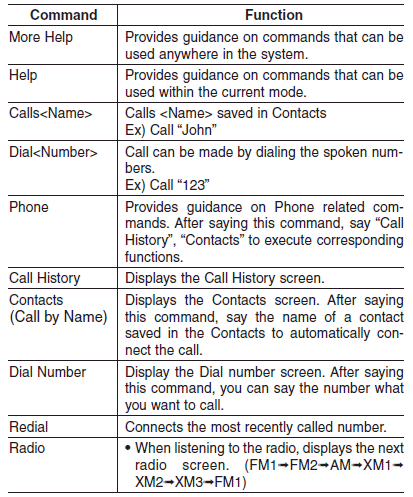 Upon inputting your contacts, special symbols and numbers cannot be recognized by voice. For example,“# John Doe%&” will be recognized as “John Doe”. 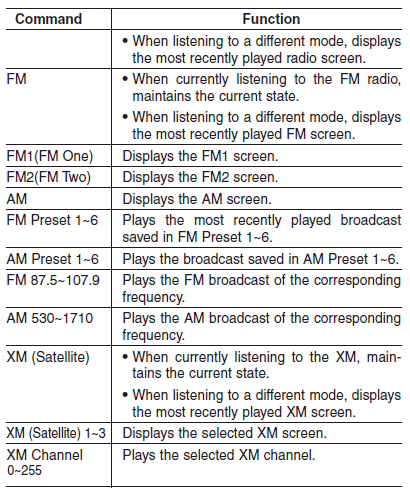 • FM/AM radio commands: Commands that can be used while listening to FM, AM radio. 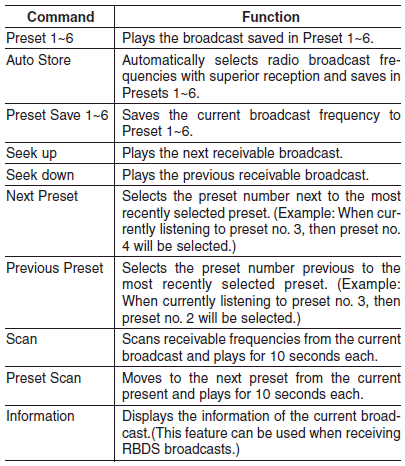 • Satellite radio commands: Commands that can be used while listening to Satellite Radio. 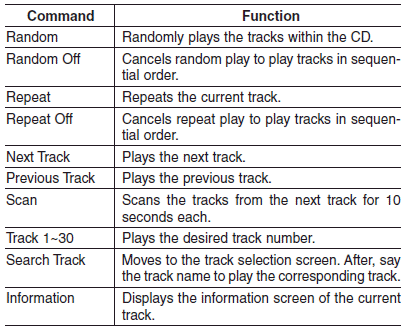 • Audio CD commands: Commands that can be used while listening to Audio CD. 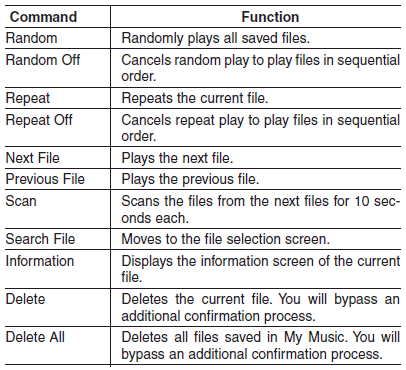 • MP3 CD / USB commands: Commands that can be used while listening to music files saved in CD and USB. 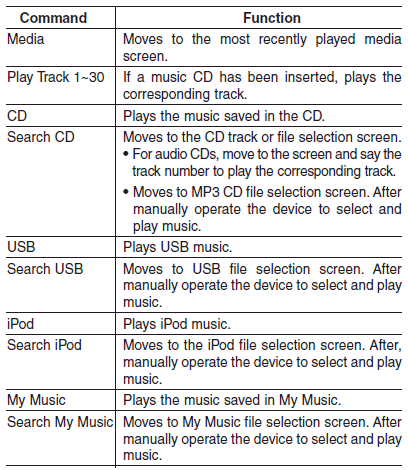 • iPod Commands: Commands that can be used while playing iPod. 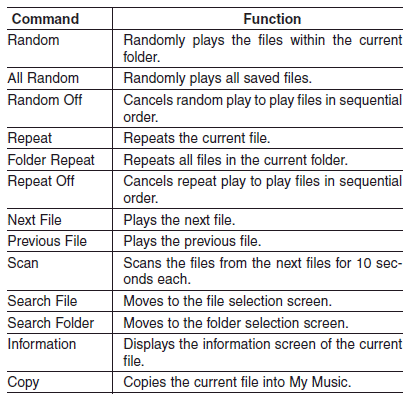 • My Music Commands: Commands that can be used while playing My Music. 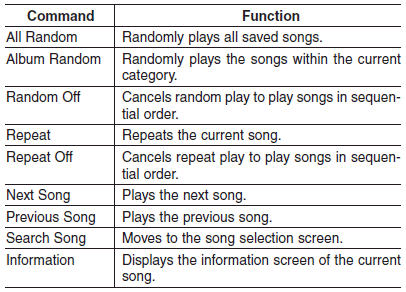 • Bluetooth® Wireless Technology Audio Commands: Commands that can be used while playing Phone Music.